Welcome. I am so happy that you stopped by. My garden gate is always open for you to come in and sit and relax for a few minutes while I share with you the inspirations for my art. I am popping in from my blog break to say hello and share a new painting. Southern California is under the worst drought conditions in decades and everyone has been asked to save on water. Our city has been very good in educating us about saving water and so far we have been able to cut back enough in reducing our household use that we can still water the garden. Let's join Bentley, my Studio Assistant, in the kitchen garden to look for inspiration for a flower shop painting. 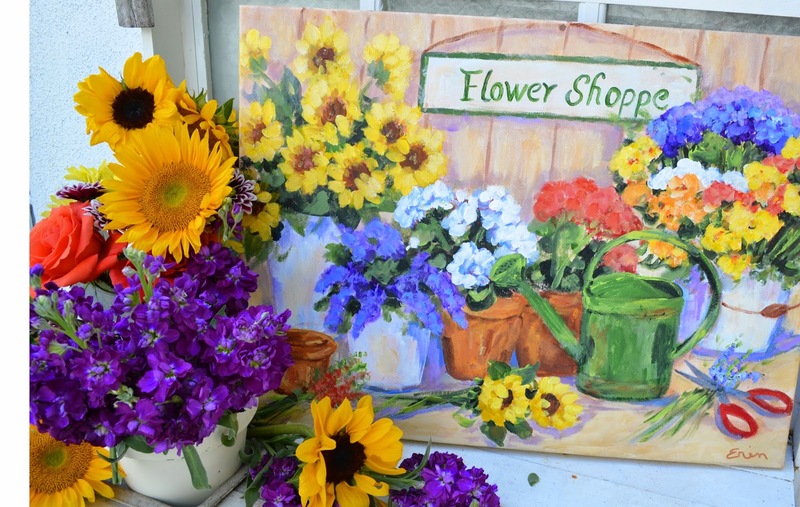 I love adding items with patina and rust to the painting and want to use the old rusty watering can in a flower shop painting. 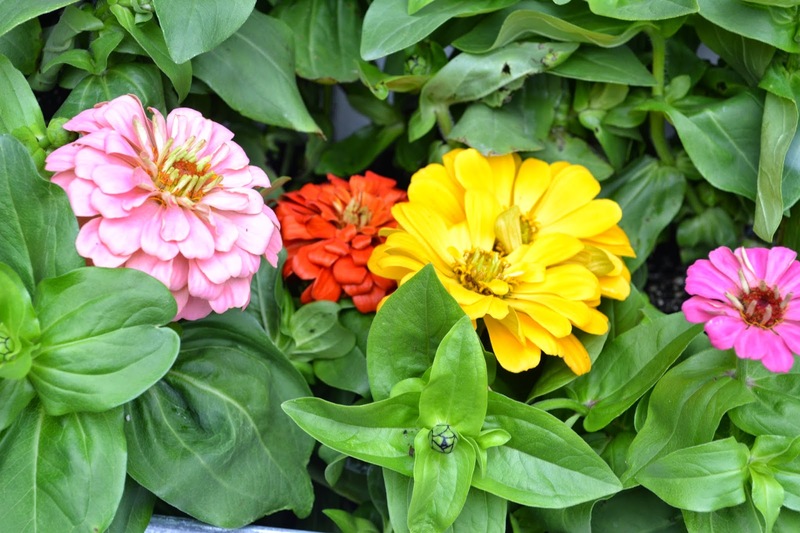 The Zinnias are blooming early this year due our unusually sunny Spring weather. Thank you for stopping by. I sincerely appreciate your visits, e-mails, comments and those following my blog. I apologize for not staying with my regular weekly posts, however, I am still taking breaks to work on my big art show in May and will pop in to say hello as time allows. Your flowers are beautiful Erin. I love your paintings. They look so real. I am waiting to hear how we are going to handle the water situation here in Fullerton. I have cut back on watering to only 2 days a week and using less laundry soap so I can save grey water for plants. I don't care if the lawn dies, but not my roses. Good luck on your Art Show. Erin, your real gardens mirror your beautiful painted gardens. Eye-candy for sure ! I hope the drought is over soon , this seems to be a never-ending situation for your part of the U.S. if I am hearing the weather reports correctly. 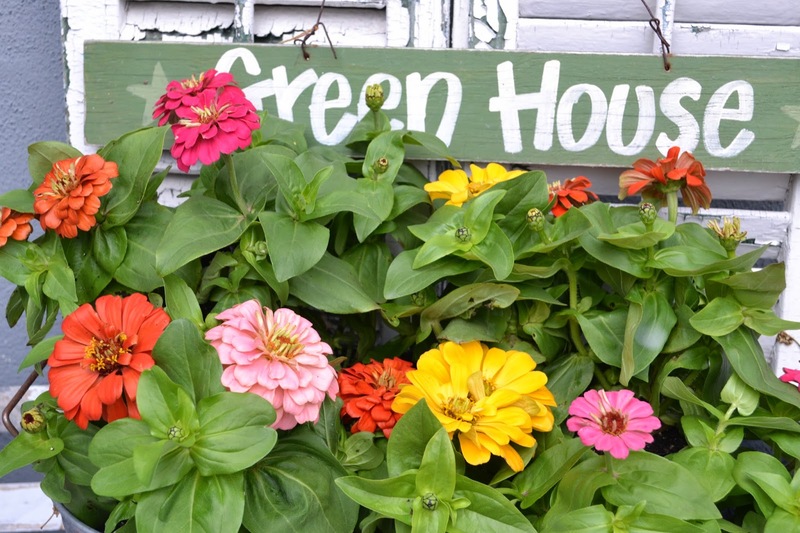 It is good to know how to conserve water and still be able to grow productive ( be it vegetable, flower, decorative, or all )gardens. 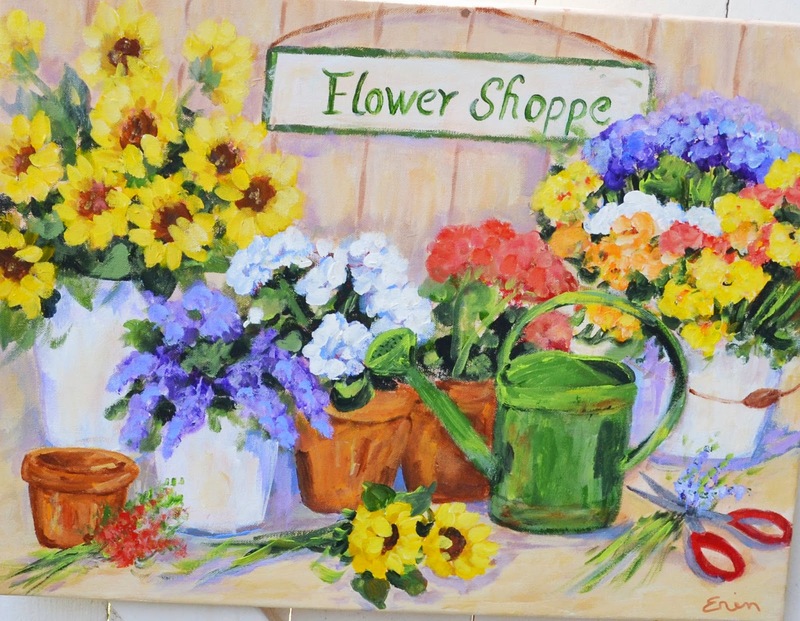 A lovely painting, so cheerful. 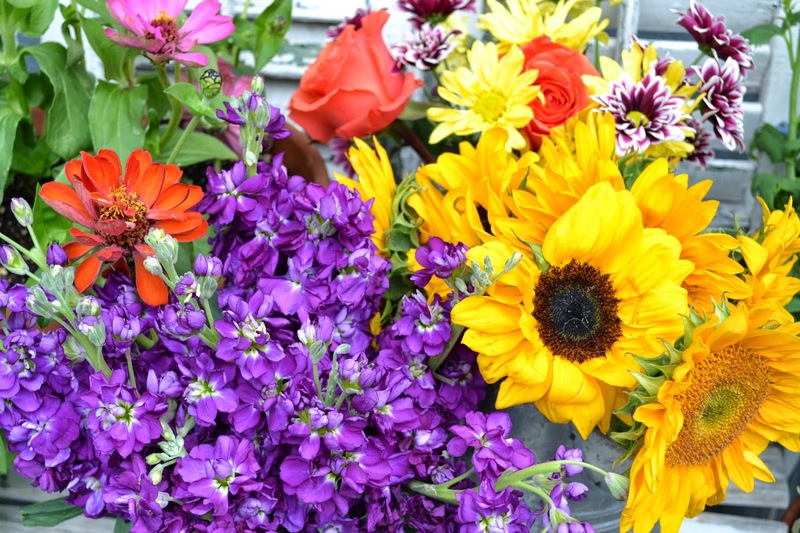 It's autumn here so these flowers are just a memory now. 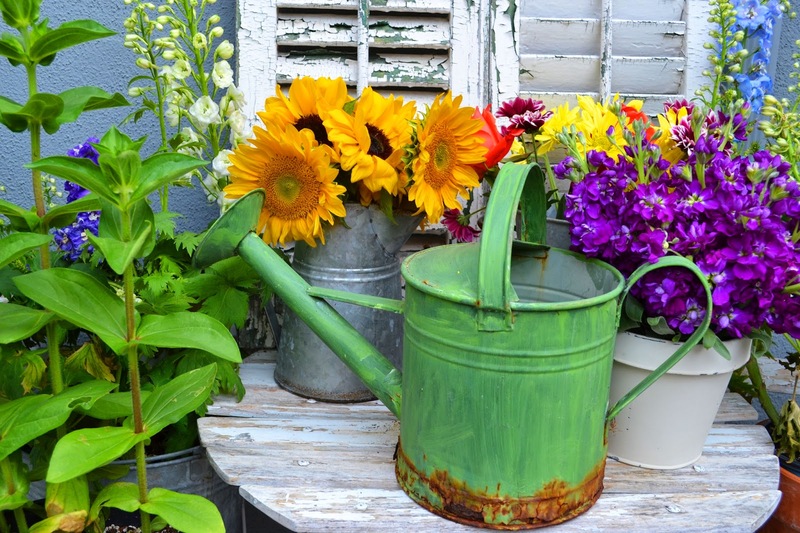 I am LUSTING over that green rusty watering can. Just so you know ... it's a good thing we're not neighbors otherwise, it just might come up missing. Beautiful garden, beautiful work and adorable dog. How are your knees doing? My wrist is healing so maybe in May we can get together. You have such a knack for putting it together. Your gardens are so lovely. Erin, love your painting! Those chippy shutters and rustic watering can has me drooling. 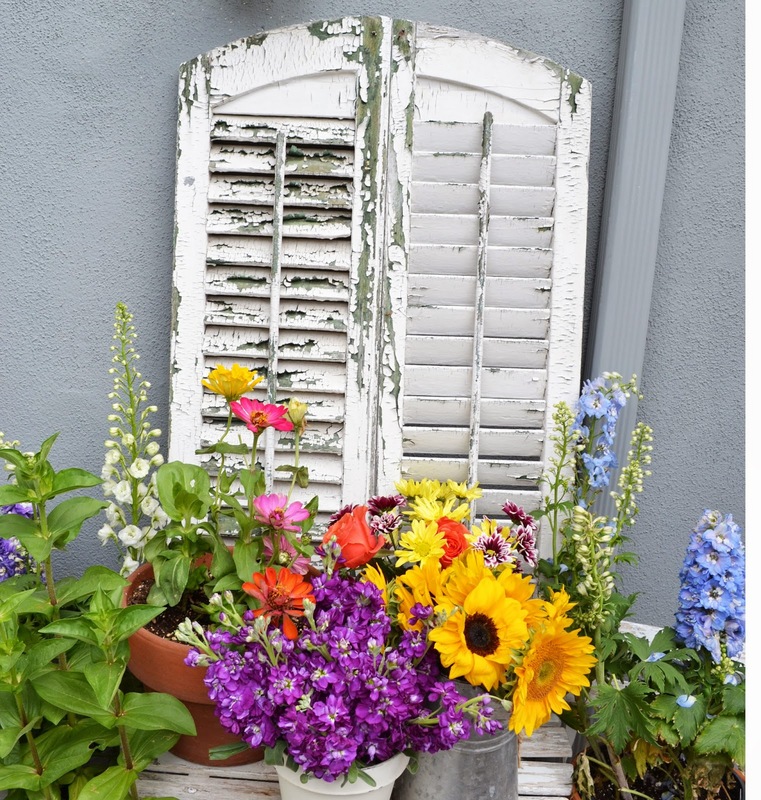 I have been wanting to find some rustic shutters. Love how they are arched. Zinnias are one of my favorite annuals. I sprinkle seeds the first of May. 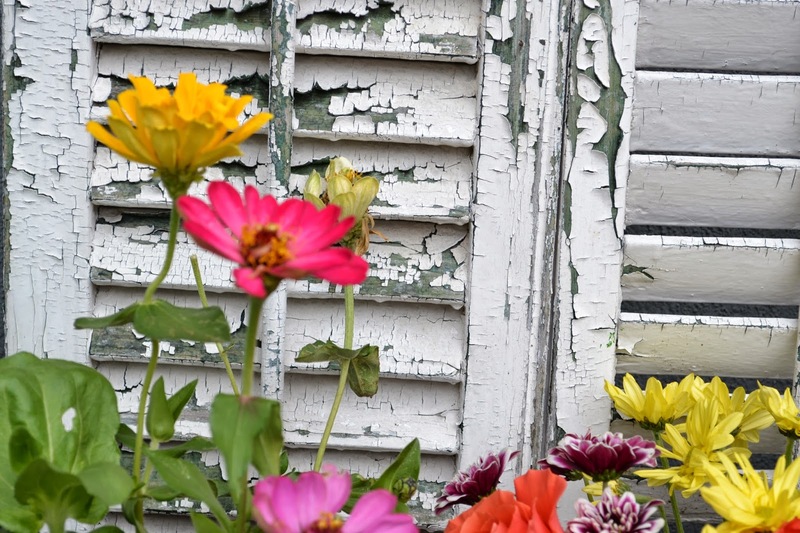 Love that olden shutter...and the painting is so pretty, Erin. Such a gift you have. As dreamy as ever. The Zinnias are divine. I'm so blessed by your gifts.